The British Gold Half Sovereigns were first minted in 1544 under the rule of King Henry VIII. Since its inception, it has seen various changes in its design with the changing monarchs. Although it is one of the longest running series, it also has low supply due to several pauses in its production throughout history. It is still being produced today as a collector’s coin. The coins struck from 1911­-1936 fall under the reigning period of George V. These British Gold coins are excellent golden time piece memorabilia of Great Britain history. Once utilized as currency before the issuing of the British pound and ten shillings. 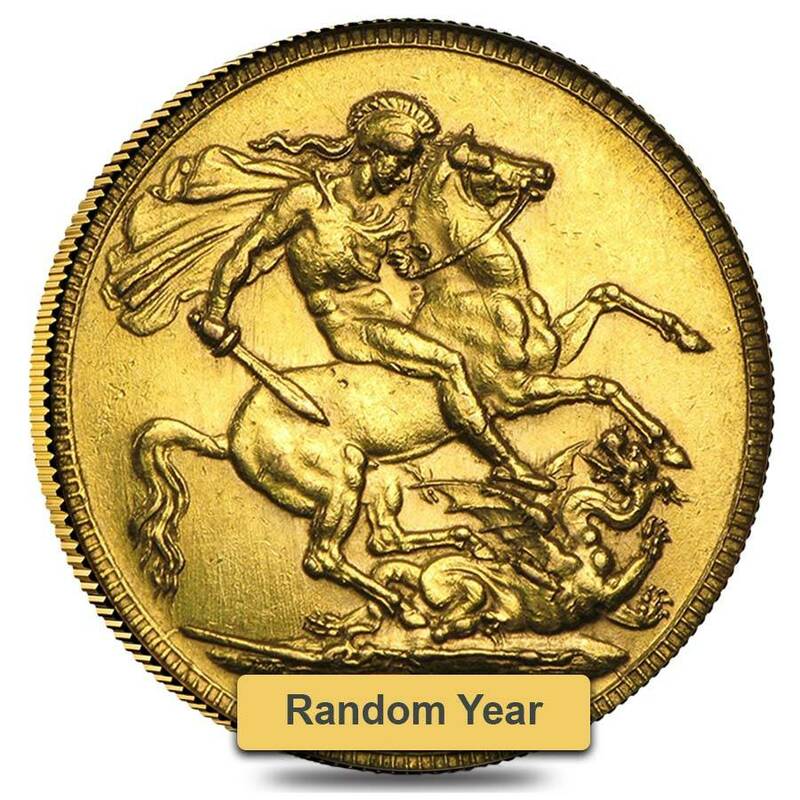 It is a very sought-­after coin in the numismatist world. Contains .1177 Troy Ounce of .9167 fine gold. Each half sovereign coin will be shipped in protective plastic flips. Obverse: Features a leftward facing handsome bust portrait of King George V. The main device is surrounded by inscriptions in Latin " GEORGIVS V D.G. BRITT: OMN: REX F.D. IND: IMP:" which translates to “George the Fifth, by the Grace of God, King of all the Britons, Defender of the Faith, Emperor of India.” A design by Edgar Bertram Mackennal. Dates and mint mark will be chosen randomly based on availability. 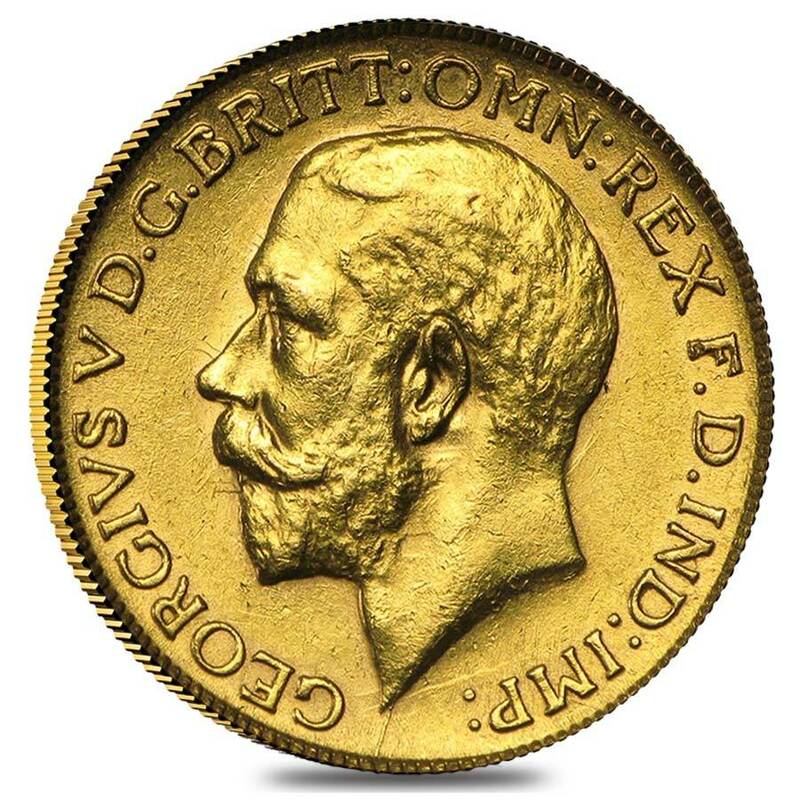 Why Buy George V 1911 ­ 1936 Half Sovereigns? There are only a limited number of these coins available as a majority of them were melted by the government to pay the war debt during the World War I. Compared to full sovereign coins, half sovereigns are an affordable option. Highly reputed and internationally recognized coin, hence easy to buy and sell. The small size of the coin makes it easy to carry and store. Its intrinsic value is higher than its face value. Due to its historical significance, rarity, age, and artistic merit, these coins have a high demand in the numismatic industry. The half sovereign coins were first mined by the British Royal Mint in 1544 during the reign of King Henry VIII (1509­-1547). It continued to be issued by the Royal Mint in London and other branches of the Royal Mint in different countries during the reigns of King George IV (1821-­1830), King William IV (1831-1837), Queen Victoria (1838­-1901), King Edward VII (1902-­1910), and King George V (1911­-1915). King George V was born as George Frederick Ernest Albert on June 3, 1865. He was the grandson of Queen Victoria and King Albert. After the death of his father King Edward VII in May 1910, he succeeded the throne. His coronation took place on Thursday, June 22, 1911. Married to Mary of Teck on July 6, 1893, he had five sons and one daughter. During King George V’s rule, millions of gold coins were struck, but only a limited number of coins were used for currency due to the World War I (1914­1918). The public was instructed not to use gold and government had to issue treasury notes for one pound and ten shillings. By 1915, the Royal Mint totally stopped production of gold coin and the gold had completely disappeared from circulation. However, the sovereign coins continued to be minted at other branches of the Royal Mint in different countries, which also came to a full halt by 1926. These coins were not struck until 1980 after that. The half sovereign coins during King George V’s reign had his leftward facing bust portrait on the obverse of the coin. This was a design by the famous Sir Edgar Bertram Mackennal. He was a renowned Australian sculptor, and he is well­-known for designing the coinage and stamps for King George V’s government. 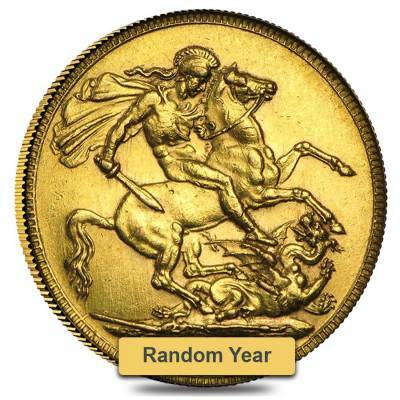 He was also the first Australian to be knighted by King George V.
On the reverse, the coin features the legendary image of St. George mounted on horseback slaying a dragon, which was a design created by Italian engraver Benedetto Pistrucci. He was a gem engraver, medallist and coin engraver and was the chief medallist at the Royal Mint in England. The extremely artistic designs of these coins have made these coins internationally recognizable. Though small in size, due to its rarity, age, and historical significance, it has gained popularity among numismatists and there is a very high demand for it in market. Bullion Exchanges is pleased to offer you these George V 1911 ­- 1936 Half Sovereigns at one of the most competitive prices in the industry. Feel free to browse our vast collection of British Gold Coins today to become a proud owner of an inseparable part of British coinage history. Contact us at 800-­852­-6884 if you have any questions in regards to British Gold Sovereign coins. With this purchase, you earn 172 Bullionaire Bucks 172 BB = $0.17. For every $1 spend, you will earn 1 Bullionaire Buck which is equivalent to $0.001 off a future purchase. 172 BB = $0.17.